A FEW hours after the day’s business got under way at the Committee of Public Accounts (PAC) in Leinster House last week, there was a controlled explosion in Committee Room 3. Seamus McCarthy, the Comptroller and Auditor General, was answering questions from committee members about a report published by his office last November. That scathing document detailed how the University of Limerick was excessively and inappropriately generous to certain staff members during the presidency of Dr Don Barry. In particular, the C&AG was describing his reaction to how senior UL managers misrepresented the facts when questioned about unauthorised pay-offs and unwarranted pension arrangements. In the careful language usually used by civil servants, that was strong enough. But the C&AG wasn’t finished. Expanding on his point, he pulled the pin out of his metaphorical grenade and tossed it across the room. Almost four hours into the meeting, the Social Democrat TD for Kildare North, Catherine Murphy, reminded the C&AG of what he’d said — and posed a question. Catherine Murphy: “I have been attending this committee for about two years and I don’t recall you ever saying anything similar to what you have said today, in relation to walking away. Are there similar situations to this that you can recall, in recent years? The C&AG’s conclusion was all the more damning for being measured. Nobody was left in any doubt about his unhappiness at the way his office was treated by a public body playing by its own rules. The UL president, Dr Des Fitzgerald, was flanked in the committee room by his right-hand man, Gerry O’Brien, who came with him from UCD. They are ambitious men, anxious to put the controversies in the past and the university in a better place. In his opening speech, Dr Fitzgerald had highlighted some of the many good things about UL. It was, he said, the Sunday Times University of the Year 2019. Student satisfaction rates, he declared, have never been stronger. Graduate employability was at an “enviable” level. A new city campus had just been announced. But, said Catherine Connolly, the PAC wasn’t interested in hearing “how good the college is”. It was not, she said, “the issue before us”. Time after time, deputies described what they were hearing in shocked tones. If you hadn’t been following numerous twist and turns in the UL saga since 2015, it must also have been bewildering. “It is very difficult to hear about the ongoing pain and anguish of those whistle- blowers,” Ms Connolly said. “Forgive my frustration,” she told the UL president, after reeling off more of the back story — what the pres- ident calls “legacy issues”. Later, she seemed exasperated by the gaps in UL’s knowledge about who did what and when. The failure to make people accountable rankled with her – and every other TD in the committee. Nobody asked the question, but after listening to the new president face the music for six hours, it wouldn’t have been an unreasonable enquiry. If he had known how much of a mess there was to clear up, would he have taken the job in the first place? The remit of the PAC is to hold public bodies accountable for how they spend taxpayers’ money. Arguably, it’s the kind of work they don’t get enough recognition for, particularly from their constituents. Someone has to perform this function – otherwise there are no checks and balances and corruption or incompetence can prosper. Of course, it’s also the media’s job to hold institutions accountable. But in a tough economic climate for trusted news organisations, that’s easier said than done. As an example, there was just one reporter on duty at last week’s PAC meeting – Jess Casey, of this newspaper. Marc MacSharry, the Fianna Fail TD for Sligo-Leitrim, did not disguise his alarm at the contents of the C&AG’s report into pensions and severance packages signed off in shady circumstances. Assurances by Dr Fitzgerald that there was “no evidence of fraud”, according to “expert legal advice”, did not convince him. The wrongful use of public money is to be condemned, of course, but for me the shameful treatment of decent people is the bigger problem. UL’s efforts to right these wrongs have been unconvincing. The failure to resolve the case of Persons B and C, almost four years after their wrongful suspension from the finance department, is one example — but there are others below the radar and still unresolved. Contrary to Dr Fitzgerald's narrative, most do not feel that UL has listened to them, or intends to do so. It is as if the institution does not truly understand – or even want to understand – how UL employees suffered because the HR function in particular acted in the way it did. “There were two people who were primarily involved with this,” said Dr Fitzgerald, citing the former directors of HR and finance. Both have “stepped down” from their positions, he told the members. Asked by Mr Fleming how he could have trust in any employee who misrep- resented facts to the C&AG, the president said there were “processes in place” to deal with the findings of the C&AG report. He added that he could not “pre-empt the investigation, because it would create huge difficulties for us”. The contrasting fates of the whistleblowers and these senior managers – and also the UL employees who won big because of what the C&AG euphemistically described as “an arrangement” – was not lost on the PAC members. THE C&AG was keen to stress that he accepts Dr Fitzgerald’s assurances that misrepresentations of the type laid bare in the November report “will not occur in the future”. This was a welcome comment, but it remains to be seen if full and honest disclosure can now be relied on at UL. As revealed by the Leader last week, serious questions have been raised around the reliability of the student records system. It is absolutely the case that UL has tried in the past to conceal this problem, along with the potential impact on the results of potentially thousands of students. 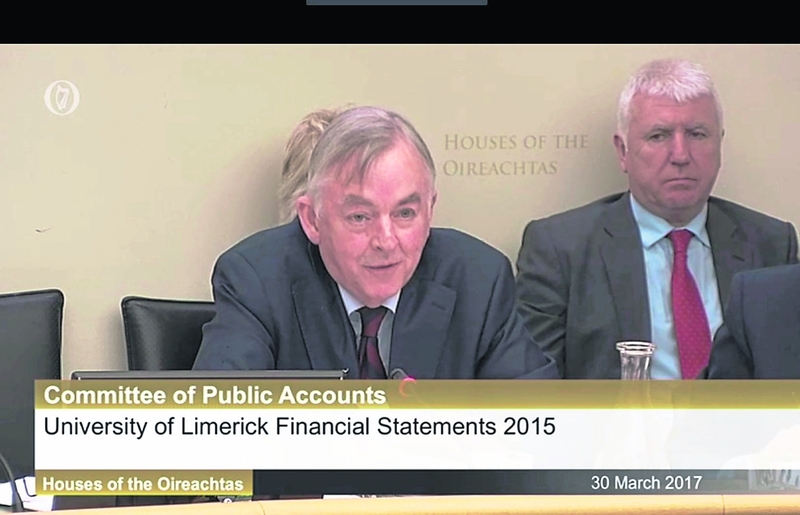 Encouragingly, the PAC was given an admirably clear explanation about the problem — and the eye-watering financial cost of dealing with it — by Liam O’Reilly, the head of information technology at UL since March 2016. While Dr Fitzgerald was at pains to assure students and parents that only one incorrect degree award had been discovered (and later corrected), it was obvious from Mr O’Reilly’s testimony that a proper review of the records has not yet been carried out. The truth is that we do not know what the impact of this problem has been — and it took yet another whistleblower to force UL’s hand and come clean about the issue in the first place. There is a balance to be struck between playing down fears and being transparent about a matter of potentially major significance. UL has chosen to deal with the matter by hiring consultants, amid great secrecy. Thus, it has been able to control the information about what went wrong — or rather, the lack of information. He who pays the piper, or the consultant, calls the tune. “At this stage I don’t think there is a need for an independent examination,” Dr Fitzgerald said. God knows, we’ve had enough UL reports in the last three years to last us a lifetime, but the president should bear in mind that only an independent review can provide the unvarnished truth. unwelcome though it may prove to be. There are many who wish the new UL management team well in their efforts to bring this unhappy chapter to a close, including the Limerick Leader. Dozens of comment pieces later, that’s still the case. The Leader will always celebrate what UL does best – providing its students with a fine education, on a world-class campus that gets ever more impressive. Not before time, there are plans for a UL presence in the city centre – a development that deserves vigorous applause. It would be nice to be able to move on, to focus on the positives instead of the sins of the past. That cannot happen, however, until UL gets its house in order. And it was painfully clear from what we heard at the PAC that this long-running saga is far from over.